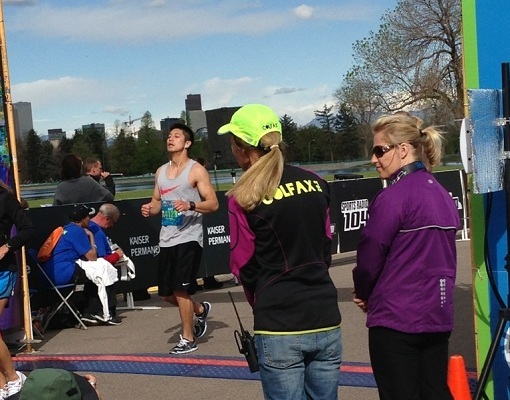 Last December, my friend surprised me with an entry to the Denver Colfax Half-Marathon. I had just reached my goal of 100 miles in one year, and was ecstatic for a new challenge. Visions of crossing the finish line to hundreds of cheering people and wearing a race medal danced in my head. Unfortunately, the excitement quickly faded. You see, up to that point, the farthest I had ever run was 3 miles. A half-marathon is 13.1 miles. Fear and anxiety sank in. I even tried to think of an excuse to get out of the race. 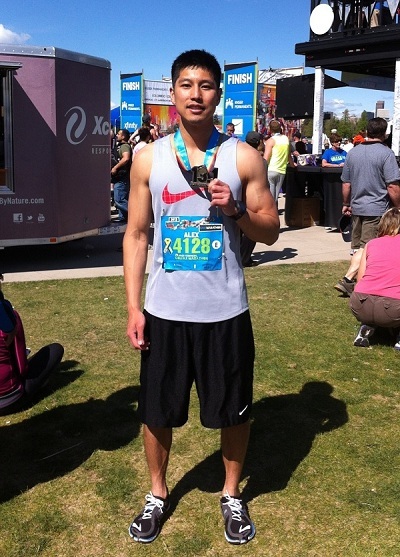 Luckily, I stuck with it and 4 grueling months later, I completed my first half-marathon. I finished in 01:48:12 with a pace of 8:15. It was an extraordinary experience. Here is the recap of my half-marathon. The weather conditions couldn’t have been any better: grey, overcast, and 55 degrees. Morale was high, and people everywhere were laughing, taking pictures, and doing warm up jogs. With the lively music playing all around, it easily could have been mistaken for a Woodstock concert. My nerves were surprisingly calm. I was running on 3 hours of sleep, a Clif energy bar, and a banana. I don’t remember saying or doing much. Just a couple high-fives to my team and it was time for business. With thirty minutes to go, they steered us into our respected corrals. I was in Group D which, judging by the pace groups around me, looked to be the 9:15 minute/mile group. This was good by me, since I was on a mission and didn’t want anyone in my way. It seemed like an eternity in the corral. Thankfully, the “let’s-get-ready-to-rumble” announcer kept energy levels high with motivational dialogue and jokes. When the national anthem finished, the headphones went in. Each wave was staggered about 3 minutes. Honestly, it was the best start to a race I’ve ever been a part of. There were no tripping over anyone’s feet, or packs to maneuver around. The streets were wide, with no bottle-neck turns early on. My overall goal was to finish under 2 hours, which is a 9:09 min/mile pace. To achieve this, the plan was to run a “negative” split, meaning I would run the first half of the race slower than the second half of the race. In theory, this conserves energy stores and allows a stronger finish. Easy in practice, but hard to execute. The start was fast. Blazing fast. Maybe it was the adrenaline, or two straight days of spaghetti inside me. The first mile (through a beautiful park) was over in 8:05. So much for starting slow. I quickly dialed it down. Oddly enough, I did not enjoy the first highlight of the race - a run through the Denver Zoo. The paths were extremely narrow and crowded, and all I saw was a mountain goat and some flamingos. I’m one of those people who constantly check their GPS watches when they run. I love statistics, and getting feedback on my performance is very helpful for me. During the run through the Zoo, however, I completely forgot about the time. Perhaps I was too busy scanning for animals, or avoiding feet and bodies in front of me. When I emerged, I glanced at my watch and was shocked. I was almost 1/4 of the way done. I couldn’t believe how quickly the miles went by. I felt unstoppable. As much as I wanted to push the pedal, a small voice inside me kept shouting “DON’T DO IT”. So I settled in and hit the cruise control button. It was the most enjoyable section of the race for me. Just me, my music, and three straight miles of pavement as far as the eyes could see. It was Euphoria. I was pumped up and feeling good when I hit Mile 7. Until I realized everything I did in the last hour, I was going to have to do again. Sticking to the plan, I turned my effort up a notch. If I was doing 70% capacity before, my goal was to do 80% here. For me, this stretch was difficult and more of a mental challenge than physical. 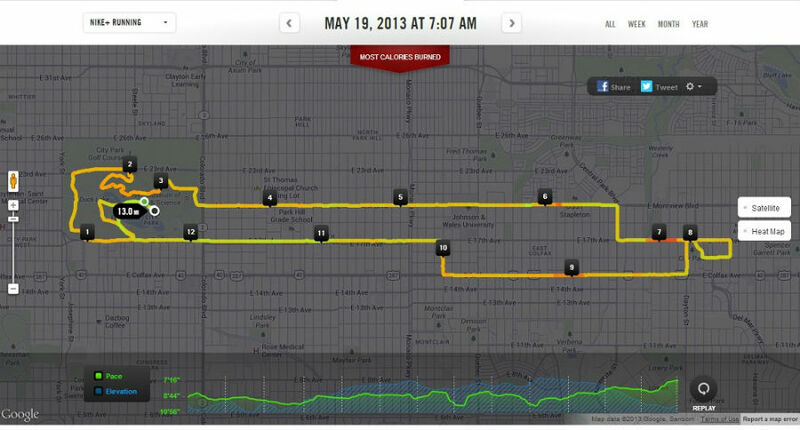 Running on Colfax was a blur. All I remember thinking was “wow, they closed down a lot of cross-streets for this race”. Reaching this marker was like waking up from a dream and getting hit with a dose of reality. Alex, you really might finish this race. Just three more miles and you never have to run another mile again. I ramped my engines up to 90% and pushed forward with the hardest part of the race. I focused on how many people I could pick off, with my (supposedly) extra energy. Lungs on fire, legs dragging heavily, I wanted to stop so many times. But nothing else mattered, because with a couple clicks on my iPod, I was saving the world with Swedish House Mafia. Crossing the finish line was overwhelming and surreal. For a second or two, I almost forgot where I was. I was filled with so many emotions. The sweetest part? My friends had made their way to the finish line, and was able to share the moment with me. Their support and excitement truly helped me along the race, and made the entire experience that much better. 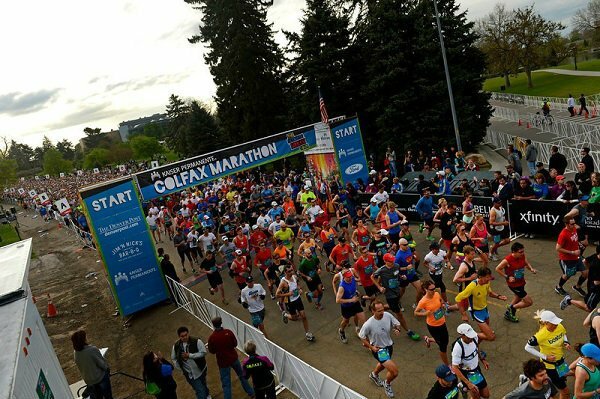 Past the finish line, I was met by a volunteer who placed a 13.1 Colfax Half-Marathon medal around my neck. I couldn’t take my hands off of it, and still wear it from time to time around the house. It was an honor to be a part of all the athletes who competed, and reminds me I still have so far to go. Fifteen months ago, the prospect of running two miles straight was unfathomable to me. Now, the distance is a nice warm up on my longer runs. Anything is truly possible if you put your mind to it. In the end, the race surpassed all my expectations. It was a perfect day to run, share stories, laugh with friends, and drink beer in the sun.